We all have loads of survival equipment sitting around our house. When a disaster strikes, how do you plan on carrying that equipment? You obviously can't duct tape it all to your body and hope for the best. I suggest that you get a proper backpack. A good backpack will allow you to carry your equipment as smoothly as possible, and it'll let you organize your gear in a way that will enable you to access it lightning fast. In this blog post, I'm going to do a quick overview of the 9 best backpacks for survival. 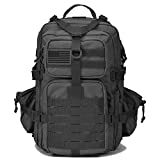 These backpacks have the room to carry your most important gear, and they're all strong enough to withstand the rigors of life's most brutal moments. 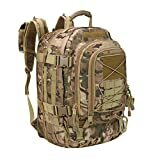 Before we look at backpacks, I want to go over the different features that you should look for in a survival pack. In the end, I'll tell you which backpack is the overall winner by comparing it to these critical requirements. How Much Of A Beating Can It Take? A survival backpack isn't worth much if it isn't built to withstand the same situations that you'll be expected to endure. Survival situations are gritty, and they can break down equipment that isn't made to be tough. This usually has a lot to do with what materials are used to make a backpack, and how much attention to detail was put into the design. Materials such as ballistic nylon and Ripstop nylon are typically more than good enough for a survival pack. The straps should be made from an equally durable material, and you should ensure that the straps are attached to the bag securely. If you've been prepping for longer than five minutes, you've probably amassed quite the collection of survival gear. But if you can't fit at least the necessities into a survival backpack, it's not worth buying. The size of the bag that's best for you is heavily dependent on what you expect to carry. If you're a minimalist, you might be able to get away with a 1-liter bag. Most people will need to bring much more equipment than that, though. I like bags that can hold between 30 and 40 liters. So, that's one of the main requirements that I'll have when I pick a winner. Think back to your school days, and remember what it was like to jam fifteen textbooks into your cheap book bag. Was it easy to carry? I guess that it wasn't. When you were in school, you only had to move that bag around the halls, and you might have had to carry it during a short commute to and from school. 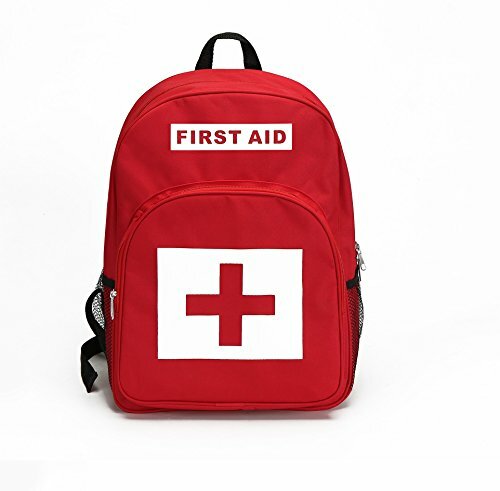 In a survival situation, you might have to wear your backpack during hikes that last for days or weeks. You might have to climb over obstacles while wearing it. If so, then you want your bag to be as comfortable as possible. One of the main factors in how comfortable a bag is if it can be adjusted on the fly. You can just change the should straps. However, you'll still want to buy a bag that provides plenty of room for adjustment. You also need a bag that has the right amount of padding on the straps, and a little padding on the bag itself isn't a bad thing to look for. You'll probably be carrying a lot of weight in your bag. So, I recommend getting one that has as much padding as possible. Chest straps can also help to make a bag more comfortable to carry under heavy loads. Some features can make your life easier, but they aren't necessary for a bag to do its primary job well. However, I'll be looking at the number of bonus features that a bag has to pick an overall winner. So, you should know what I think makes a bag stand out. Molle is the funky strap system that's found on a lot of tactical bags. It allows you to attach different things to the surface of a bag, and it adds an infinite amount of customization options to your bag. Molle isn't a necessity, but it can make it extremely easy to access your most essential items. You can attach canteens, knives, flashlights, and other gear that you need to access quickly to the surface of your bag with it. If you prepared adequately, you probably have several containers that you can hold clean water in. Water is such an essential part of survival, though. You can never go wrong by having a water bladder in your backpack. A hydration bladder is a durable bag that slides into its own compartment in your backpack. A straw usually sticks out of your bag, and that allows you to get a refreshing drink while you have your bag on. It's not really necessary to have when you have the proper equipment, but it's a convenience that can make any bag better. You can waterproof your backpack at home. If you don't want to do that, you can just put all of your items into their own Ziplock bags before putting them in your backpack. However, it's nice to have a waterproof bag without all of the extra efforts. This isn't a standard feature, but it is one that can help a lot in a survival situation. The Gelindo meets all of my requirements for a backpack, and it's incredibly affordable. It does lack one feature that I would have really liked. While the bag is made from a high-density fabric, it's not made from one of my preferred materials. The bag is durable, and it meets my requirements for durability, but a better fabric would have easily made this the best backpack on the list. Despite the one minor flaw, the Gelindo is excellent. 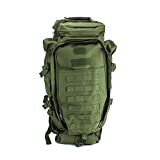 It has a 35-liter capacity, padding on the straps, Molle webbing, and a slot to place a hydration bladder. On top of that, it also has a waist belt that allows you to store items on it, and it helps to make the bag more comfortable. The 35-liter capacity is more than enough for most people. There is plenty of padding on the straps to make it a comfortable bag to hold. The belt strap and Molle allow the bag to be customized to suit your needs. It's a very durable bag with a great price. The addition of a bladder compartment is a great bonus. I would have really preferred rip-stop nylon for the bag material. The high-density fabric is strong enough, but it's not as reliable as a premium material like rip-stop nylon. The Orca is a huge backpack. It'll allow you to carry just about everything you have. It's also made from high-quality materials. However, all of that extra space could be a burden for people who like to have a minimalist mindset when it comes to survival, and the urge to fill all of that space might leave you with 120 pounds of gear strapped to your back. The Orca hits the nail on the head in every other department, though. 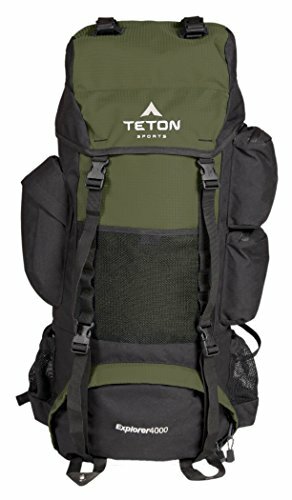 It's made from 600D polyester for durability, it's heavily padded, and it's designed to allow you to carry a lot of weight comfortably. Besides, it also includes every bonus feature that I like. It has a bladder compartment, Molle, and it has a water-resistant coating. It also has several compartments that are heavily padded to protect your favorite electronics. It can hold a lot of stuff at once. The Orca has plenty of Molle webbing for all of your favorite attachments. The straps are padded for comfort. If you have a water bladder, you can easily use the bag's bladder compartment to stay hydrated on the go. The material is a little bit better than what the Gelindo is made out of. Water resistance isn't a standard feature in this price range, but the Orca has it. You won't be able to throw the bag in a lake for hours, but you won't have to worry about your stuff getting wet in the rain. All of the extra room might inspire you to carry more than you can handle. If you load this bag up, make sure that you condition yourself properly. 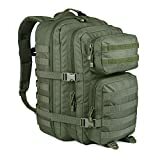 The Mardingtop isn't the cheapest bag on this list, but it is one of the biggest. In addition to its 65-liter capacity, it has an internal frame that allows you to carry such heavy loads with ease. The framework supports your gear, and it prevents your back from taking all of the burdens. The bag is made from 600D polyester, and it has plenty of Molle webbing to attach medical kits, knives, navigation gear, and more. 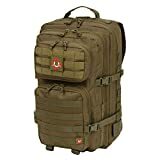 The straps and backing are both padded reasonably heavily, and the entire bag is coated with a water-resistant coating. Also, it comes with a rain cover that ensures that moisture can't enter the bag. With all of those high-end specs, you'd probably expect this bag to rate very highly on this list. While it's a great bag, I would only recommend it to people who plan on carrying hefty loads. The lack of a water bladder means that you'll have to dig out your canteen every time you're thirsty, and the excessive size will make a lot of people pack a lot of nonsense in it. If you don't wrap it to a reasonable level, you'll just have a bunch of fabric bouncing around on your back, and it can throw off the pack's balance. It has a ridiculous load capacity. It's water-resistant, and it comes with a rain cover. The internal frame will prevent your back from hurting on long trips. It's made from the same high-end polyester as the Orca. The ridiculous load capacity will urge people to carry way more than they need, and the extra weight can be a considerable burden. I really like hydration bladders. They might be a convenience, but they're still important. This REEBOW backpack isn't the highest-quality bag, but it provides a lot of value if you're on a budget. 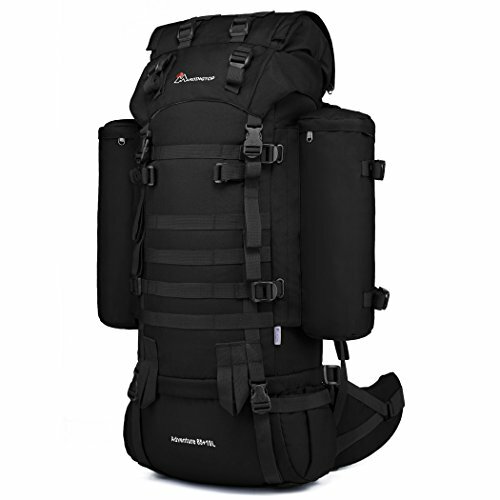 It's made from 1000D polyester, and it has a capacity of 34 liters. It fits the bill for most of my requirements. Plus, it has a 2.5L bladder compartment, and it has plenty of padding on the straps. While it has Molle webbing, the webbing isn't up to military standards. 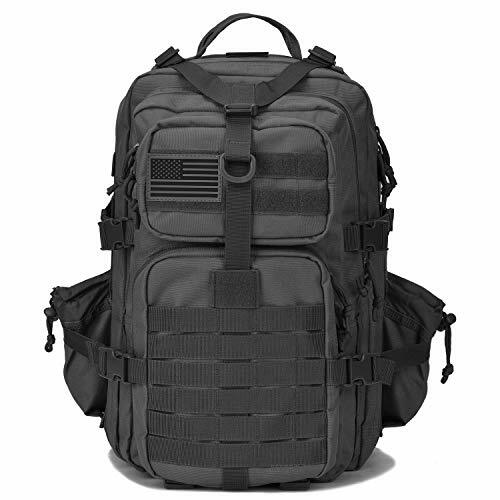 The single straps are slightly smaller than military-grade Molle. That's not a big deal, though. The bag also has two water bottle holders. So, your hydration needs are taken care of with this cheap bag. For less than thirty bucks, this bag really impresses me. It brings a lot of value to the table. The material used for the bag is pretty decent for this price range. The heavy padding on the straps will help make the bag more comfortable to wear. The Molle webbing isn't up to par with real Molle. That's not a big deal, and I can forgive that because the bag is so cheap. However, it is something to consider. Built with rifle owners in mind, the GEARDO designed to withstand the elements, and it has plenty of carrying capacity. 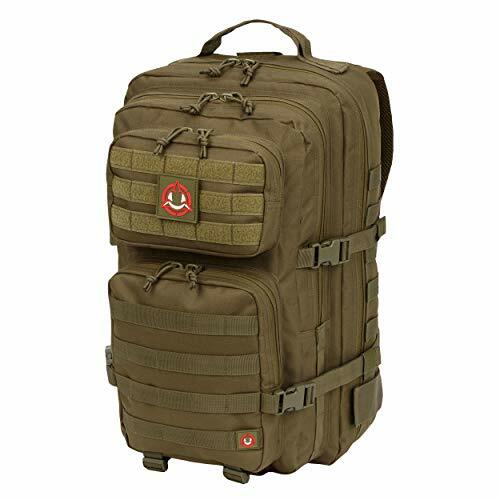 The GEARDO is designed to carry up to two full-sized rifles, and it has plenty of Molle webbing to attach other compartments for your other gear. The bag is made from 600D polyester like most of my suggestions, and it has meshed pads along the back for added comfort. Being a rifle bag, this isn't compatible with a hydration bladder. However, it does have two water bottle holders, and it has more than enough room to carry all of your survival gear. I recommend this product to firearm owners for obvious reasons. If you don't have a firearm, you will be better off buying one of my other suggestions. The bag can carry up to 2 rifles with ease. The meshed padding along the back makes the back a lot more comfortable to carry. There is plenty of Molle webbing on the bag to attach smaller pockets for organization. If you don't have a firearm, this bag isn't the best deal. I've listed several other containers that are cheaper with more features. The WIDEWAY is another large bag, but it's just small enough to be practical. In exchange for its extra bulk, you get plenty of storage room, and it can store a lot of easily-accessible gear on its surface. The WIDEWAY is made from 600D polyester and polyurethane. That makes it an incredibly durable bag. 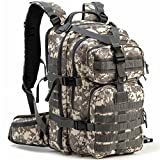 It doesn't have a compartment for a water bladder, but there is plenty of Molle webbing to attach as many water bottles as you want to the sides or front of the bag. This is a great overall option. It's a little larger than I would like, but a lot of people will appreciate all of the extra room. The WIDEWAY is constructed to be extremely durable. There's more Molle webbing on the WIDEWAY than there is on any other bag on this list. It makes up for its lack of features with its high-quality materials. I would have liked to have seen more features with this bag. It's not expensive, but it's pretty basic. That being said, I can definitely tell that the manufacturer focused on making it a good bag instead of tacking on novelty features. The PANS is an expandable bag that can carry up to 64 liters worth of gear. Unlike other large capacity bags, the PANS isn't always that large, though. When you have less equipment to carry, the bag keeps a tight profile, and it only expands when you allow it to. So, you never have to worry about having a floppy backpack getting snagged on bushes and limbs. In addition to being able to fit the roles of small bags and large bags, the PANS has a few other features that make it a solid option for almost anyone. It's a waterproof bag, and it's incredibly durable. 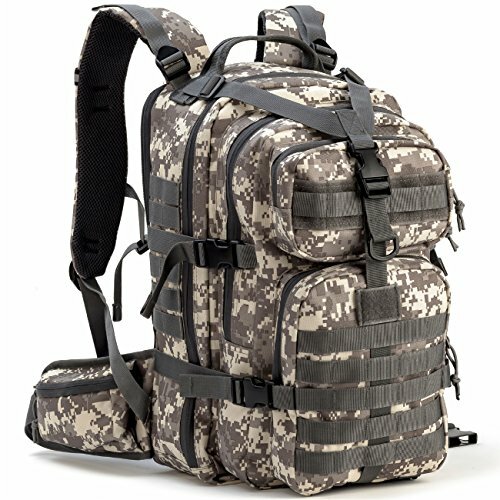 It features Molle webbing, and it has two radio compartments to store your communication instruments. 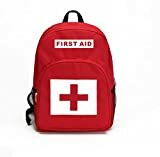 It doesn't have a bladder compartment, and I would have liked to have seen a chest strap or waist strap, but the PANS is still an excellent pack for the vast majority of people. Its expandable nature makes it great for minimalists and hoarders alike. The waterproof coating on the bag makes it a lot easier to keep your gear dry. This is one of the few bags I've reviewed that had radio compartments. In most survival situations, communication is vital. I don't know why more manufacturers don't focus on it. The Molle webbing is up to military standards. I'm a little disappointed by the lack of chest and waist straps, but the bag is excellent in every other department. You don't always need a bag that is designed to survive a nuclear winter. Sometimes, going the minimalist route is the best idea. The E-FAK is a small bag, and it's primarily intended to hold medical equipment. This isn't the type of bag that you want to try to cram an entire survival kit into. It's an excellent accessory for larger packages, and it's great for throwing in your car once you fill it up. You can fit a fully equipped medical kit into the E-FAK, and you'll still have room for a reflective blanket or small survival items. Think of this bag as a high back up stash encase you get separated from your main kit. To make it even better as a backup kit, it's completely waterproof. You won't have to worry about your gear getting soaked if you accidentally leave the bag out in the rain, or if you can find shelter fast enough to escape wet conditions. Even if all of the gear in your main bag gets destroyed, you can expect your E-FAK to be ready for duty. 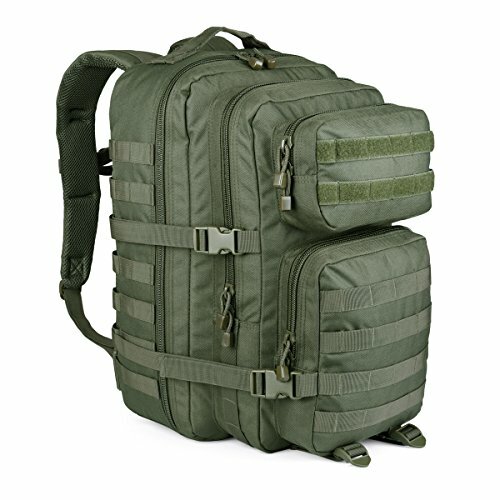 It's small enough to be a great backup bag. While it's not the most durable bag, it is durable enough to be stowed away for long periods. The bright red coloring makes it extremely visible. While it's a great bag, it doesn't meet the majority of my requirements. I won't call this the best bag, but it is a great backup. The Explorer 4000 is often praised for the comfort that it provides, and the massive loads that it can handle. However, it lacks a lot of the features that cheaper bags on this list have. That being said, it's great for people who need to carry a lot of weight for long distances. It's another internal frame backpack, and it has a 65-liter capacity. On top of its inner frame, it features several adjustment straps to help you maximize your comfort while wearing it. What keeps me from calling this the best bag around is its lack of features. It's the second most expensive bag on this list, and it doesn't even have a water bottle holder. That being said, it's probably the most comfortable pack I've reviewed. The 65-liter capacity makes it great for people with a lot of gear. It's one of the only bags on this list that doesn't look like a military bag. It doesn't have enough features to justify its price. I only recommend this to people who will have to carry a lot of gear very frequently. If I were to pick one of these bags to recommend to everyone, it would have to be the PANS. It's not the most innovative bag, but it adjusts to how much is put into it. It can take on the role of a small bag, and it can expand to carry a ridiculous amount of stuff. The other bags are much more limited. On top of that, it's comfortable and durable. So, it matches all of my three main requirements, and it has a few of the bonuses I look for. If you've gotten this far in the article, I'd like to thank you. Don't hesitate to share this with your friends, and I'd love to hear about your favorite bags in the comments.